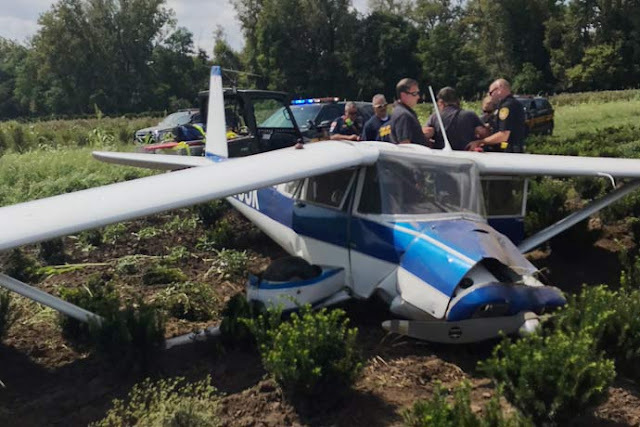 On August 31, 2018, about 1400 eastern daylight time, a Luscombe 8E, N2305K, made a forced landing shortly after takeoff from Andy Barnhart Memorial Airport (3OH0), New Carlisle, Ohio. The private pilot was seriously injured, and the airplane was substantially damaged. The airplane was registered to and operated by the pilot under the provisions of Title 14 Code of Federal Regulations (CFR) Part 91. Day visual meteorological conditions prevailed for the local area personal flight that was departing at the time of the accident. 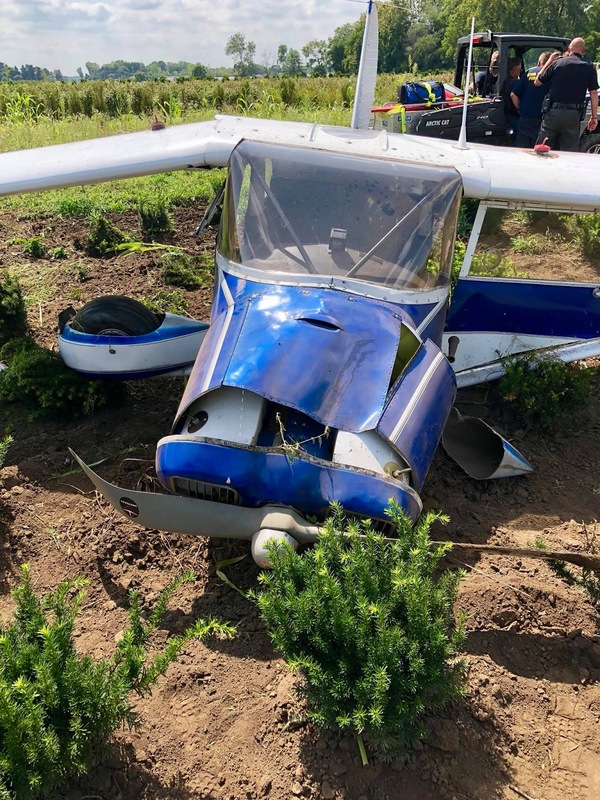 The pilot reported that he purchased the airplane on August 10, 2018, and that he had flown with a flight instructor to regain familiarity with the airplane. The pilot stated that the accident occurred shortly after takeoff from runway 27 (2,000 ft by 30 ft) at 3OH0. He noted that the airplane was slow to achieve liftoff from the runway, and about 75 ft above the ground the engine began to run rough. The pilot briefly applied carburetor heat, but he quickly deselected carburetor heat after he observed an increase in engine roughness. The pilot stated that a total loss of engine power occurred shortly after he deselected carburetor heat, and that he made a forced landing to a nearby nursery located immediately west of the airport. The airplane landed hard in uneven terrain, collapsing both main landing gear and damaging the right wing. The airplane came to rest in an upright nose-down attitude, about 0.5 miles west of the departure end of runway 27. A postaccident review of available meteorological data established that day visual meteorological conditions prevailed at the accident site. The nearest aviation weather reporting station was located at Wright-Patterson Air Force Base (FFO) about 7 miles north of the accident site. At 1356, about 4 minutes before the accident, the FFO automated surface observing system reported: wind 230° at 3 knots, 10 miles surface visibility, few clouds at 3,800 ft above ground level, temperature 29°C, dew point 20°C, and an altimeter setting 30.15 inches of mercury. NEW CARLISLE – A plane piloted by Dr. John Studebaker of New Madison crashed Friday in Clark County. At approximately 2 p.m., Studebaker’s single engine Luscombe 8A went down right after take off from the Andy Barnhart Memorial Airport, just east of downtown New Carlisle. According to witnesses, the plane had just lifted off, clearing a row of trees at the end of the runway when it started to go down. Indications are the plane lost power shortly after takeoff and landed hard, causing significant damage to the aircraft. WHIO also reported witnesses saying they heard the plane’s engine “making a weird noise” when it took off Friday. 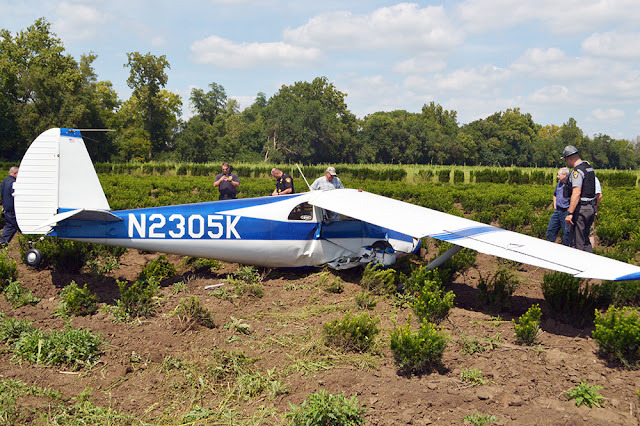 The plane landed in fields owned by Studebaker Nursery. It is not clear if there is a connection between Dr. Studebaker and the nursery. Studebaker, 75, of New Madison, was conscious and suffered only minor injuries. He was transported to Grandview Hospital. The FAA is enroute to the scene. The plane’s disposition will be determined by the FAA once they arrive. The owner of the plane is listed as Kozak Valentine of Vandalia, Ohio. No direct contact has been made with Mr. Valentine. The Clark County Sheriff’s Department and Bethel Township emergency services assisted with incident. A small plane crashed in a field owned by Studebaker Nurseries shortly after take-off from Andy Barnhart Memorial Airport just before 2:00 on Friday afternoon. The pilot, 75-year-old John Studebaker, of New Madison, Ohio, had exited the plane under his own power before rescue crews arrived and suffered what were described on the scene as minor injuries. Bethel Township Medics transported him to Grandview Hospital. “I knew he was coming down,” said a Studebaker employee who did not wish to be named. The employee said she saw heard the plane’s engine sputtering, saw it bank and it came down and skidded. “At least he didn’t land nose first,” she said. The pilot had reportedly just taken off from Andy Barnhart Memorial Airport and was headed to Greenville. Disposition of the plane will be determined by the Federal Aviation Administration. The crash is under investigation by the Springfield Post of the Ohio State Patrol. The State Patrol was assisted by the several deputies from the Clark County Sheriff’s Office.